This product was added to our database on Friday 26 January 2018. 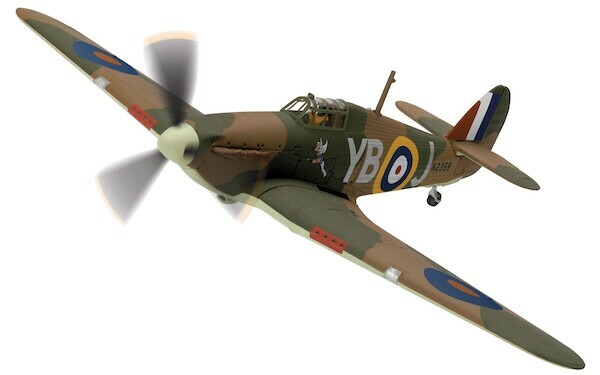 Responsible for destroying more enemy aircraft during the Battle of Britain than the combined total of the rest of Britain’s defences, the Hawker Hurricane was the workhorse aircraft of Fighter Command’s de?ant resistance against the Luftwaffe. A stable gun platform, the Hurricane was relatively simple to ?y and even easier to maintain and could be produced much quicker than the all-metal Spit?re, which was crucial as replacement aircraft would be needed in large numbers. Pilot Of?cer Leonard Walter Stevens of No.17 Squadron received Hurricane N2359 as a replacement for an earlier aircraft damaged in combat with the Luftwaffe on 11th August 1940 and applied some rather elaborate artwork to the port side of his Hurricane. It was extremely unusual for RAF ?ghters to carry any form of unauthorised artwork during the Battle of Britain, so the sight of a ‘Winged Popeye’ must have caused quite a stir around Debden air?eld, although they would have had more important matters at hand. Pilot Of?cer Leonard W Stevens served with No.17 Squadron throughout the Battle of Britain, only to be killed in a mid-air collision between two Spit?res in May 1941.